Russia’s women’s relay team have won the relay race at the sixth stage of the Biathlon World Cup in Antholz-Anterselva, Italy. ­The quartet of Svetlana Sleptsova, Anna Bogaliy-Titovets, Natalia Guseva and Olga Zaitseva produced flawless shooting, not getting the penalty loop. Zaitseva, who was the last to cover her six kilometers of the distance, started her run with a 30-second lead over second placed Sweden and managed 57.1 seconds in the end. "I want to say that I’m happy. We managed to do what we should’ve done a long time ago. I’d like to thank the girls as did their job perfectly. Only at the end of the distance, in its last meters, I realized that the gap was big enough and I finished all alone. 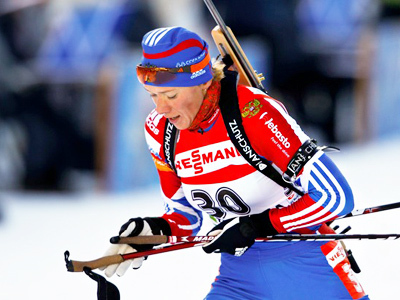 I'm very glad,” Olga Zaitseva told the official website of Russia’s Biathlon Union. Germany finished in third thanks to an impressive display from their leader Andrea Henkel in the final stage. 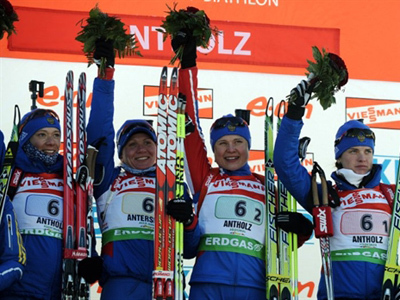 The Anterselva triumph became the first relay gold of the season for Russian women and the third World Cup gold for the country’s male and female teams.